Originally the Caribbean Cove Hotel and Water Park was part of the 344-room Holiday Inn North at the Pyramids. The original hotel did not feature a water park. General Hotels added the 50,000 square foot water park in 2004. The Water Park featured three water slides, a plunge pool, a lazy river, and water play area with a 700 gallon dumping bucket. After declining years of occupancy, the Caribbean Cove Hotel and Water Park closed in 2017. It is located just off of Michigan Road and South of I-465. After the water park closed, Drury Development bought the 10 acre property and proposed to demolish the property in order to build a new hotel. 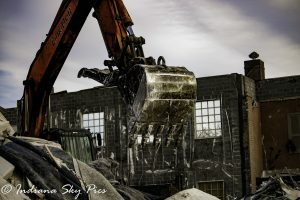 Utilizing our long reach machine, as well as several other excavators, we have meticulously been taking this building down since November 2018. We are on track to finish very soon. 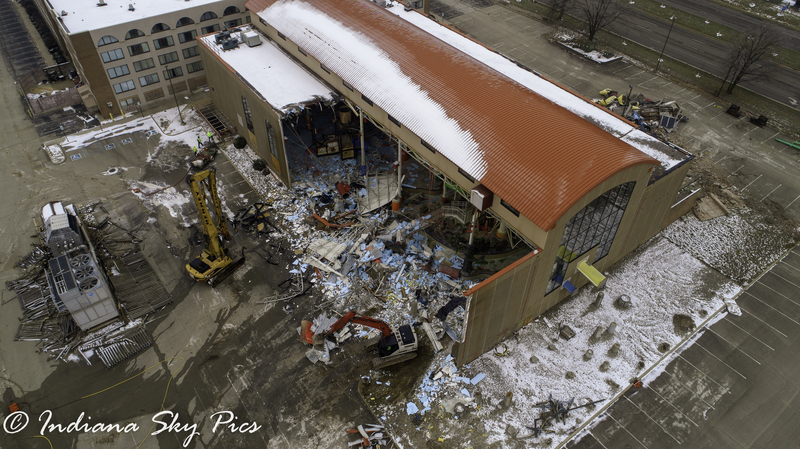 Along with the demolition of this large building, Denney Companies is also recycling the concrete and will b e crushing it onsite.